As a transplant to Bozeman, I am quick to bemoan most of the movies shown at the “big movie theater”. I moved from New York City where I had ready access to obscure movies before the rest of the country had even heard of them. Of course, I’ll go in for a big blockbuster, especially in the heat of the summer, or a shiny 20-something romance, only in the heat of the summer, when the fancy strikes but I like options. So, it has been my great pleasure to uncover a wealth of other places to see movies in town. And June promises to fulfill almost any moviegoers taste. The first offering is the documentary, Divorce Corp, showing on June 2 at 7:00pm at the Bozeman Public Library. Director Joe Sorge’s debut film looks at how money flows through the American family court system. Sorge went to MIT and started a biotech company, Stratagene, which went public in 2004. In 2000 he divorced from his wife of 17 years and ten years later made a film about the problems with our legal system. The film will undoubtedly shed light on a complicated legal process and, however biased the filmmaker may be, start worthwhile conversation about a tragedy that is so commonplace in contemporary America. 93 mins. Not Rated. Free. For those who prefer to run away from their problems instead of duking it out in a courtroom check out Matt Trappe’s documentary on family man and all-star runner, Scott Jaime, Running the Edge: The Colorado Trail. The film chronicles Jaime running 486 miles across the Rocky Mountains. Sponsored by the Bozeman Running Company, the film will play at the Emerson’s Crawford Theater on June 4 at 7:00pm. Sharpe will be in attendance for a Q&A after the film. 45 mins. Not Rated. Free. Friends of KGLT present the Montana premiere of Christopher Hanson’s first feature Scrapple. 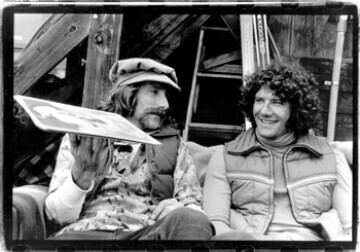 Shot in Telluride in 1997, the film is a send up of 70’s stoner comedies following a crew of ski-bums in pursuit of the American dream. The Taj Mahal-produced soundtrack will be worth the price of admission alone. Taj Mahal re-recorded his favorite songs and added originals. Taj also added tracks by Sam Bush, JJ Cale, John Martyn, Cymande, Widespread Panic, and more. The screening will be June 5 at 7:30pm at the Emerson’s Crawford Theater. This event is a fundraiser for KGLT. Doors open at 6:30pm with a $10 dinner buffet from the Emerson Grill. 93 mins. Not Rated. $8 tickets available at Cactus Records, Movie Lovers, and at the door. On June 12 the Bozeman Film Festival will show Jim Jarmusch’s vampire musing, Only Lovers Left Alive. Based on the BBF’s spring line-up this is a deserving closer to their best season yet. This film was nominated for a Palme D’Or at Cannes in 2013 and took home a soundtrack award. Described by Jarmusch as “a crypto-vampire love story”, the film could be an expressionists history of Motown. The story is set mostly in Detroit and features a rich soundtrack sure to evoke the bittersweet taste of romance while raising questions about the immortality of American pop music. Also on the TBD list, keep an eye out for the BFF Screen on the Green scheduled for August 23 and the $5 movies at the Ellen Theater. It’s hard to imagine spending any amount of time indoors during the Bozeman summer but if there’s a great movie showing it could be worth it. Enjoy! Aaron Murtagh is a filmmaker. He lives in Bozeman with his wife and a loving cat. The nostalgia doubled me over as we walked into the video store.